Plyometric training is a totally different way to prepare your body for the golf swing. While traditional strength training is extremely important, adding plyometric drills to your golf weight training program will prepare your body for the quick movements involved in the golf swing. Plyometric training is designed to produce quick, yet powerful muscle contractions. This type of training is extremely important for athletes because you can mimic many different sport specific motions with these exercises. The combination of both speed and strength equals power! During plyometric drills, your muscles build and store energy while your muscles are lengthening. An easy example of this is your quadriceps during a jump. When your perform a small squat prior to the jump, the quads are actually lengthening. Whenever you jump, all of that stored energy is released and the quads contract, or shorten. Making sure that this mechanism of storing and releasing energy is working efficiently is key to athletic performance! If you don't perform a quick contraction of the muscle following the lengthening phase, all of the stored energy is lost. This mechanism is referred to as the stretch-shortening cycle. These exercises will help condition your muscles and nerves to provide quick contractions, and have been shown to improve athletic performance. Your body has "muscle memory", meaning that if your perform something enough times, your body adapts and will be able to perform that activity more efficiently in the future. This is why practice is so important with any sport! Plyometrics are used to help fine tune "muscle memory", reflexes, and proprioception. Another key physiological component of this type of exercise is the transition of specific muscle fibers. There are many different types of muscle fibers in your body, but the two main ones are referred to as Type I and Type II. Type I fibers, or slow twitch, are used more for endurance type activities such as running, swimming, or cycling. Type II fibers, or fast twitch, are used for quick bursts such as jumping, throwing, and in this case, the golf swing. Each individual muscle contains a number of each of these fibers, some having a higher proportion of one type of fiber compared to the other. Through proper training, however, we can influence these numbers and try to increase the amount of the specific type of fiber that we want. For golfers, increasing the amount of Type II fibers available in the muscles used during the golf swing can lead to increases in power! Plyometric training can be performed for all areas of the body. On this site I will provide you will specific exercises to target the primary muscles used in the golf swing. In general, the lower extremity muscles are more likely to be associated with plyometrics simply because the original intention of these exercises were to help with jumping ability. However, a powerful golf swing needs strength to be developed in the upper extremities and the core. Golfers need to focus on all areas! Before you get started, please realize that the main concern with plyometric training is safety. These exercises are not for everyone! There is an increased risk for injury with these exercises compared to some of the others mentioned on this site. Proper technique is important with all exercises, but this is even more true with plyometrics. Read the descriptions carefully, and take the time to learn each exercise before your perform them. If you are unsure exactly how to perform each exercise, then don't go any further! You can always contact me via this site, or anyone else who has proper training regarding these drills. If you have any current orthopedic problem, I would strongly advise against performing these exercises prior to consulting a healthcare professional. Also, having a partner on hand is an important part of many of these exercises in order to perform them properly. 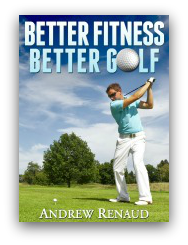 One last thing, I have an entire page dedicated to my favorite Golf Fitness Products. Here you will find plyo boxes, in addition to many other products. Please follow the link to check out the page.